19. 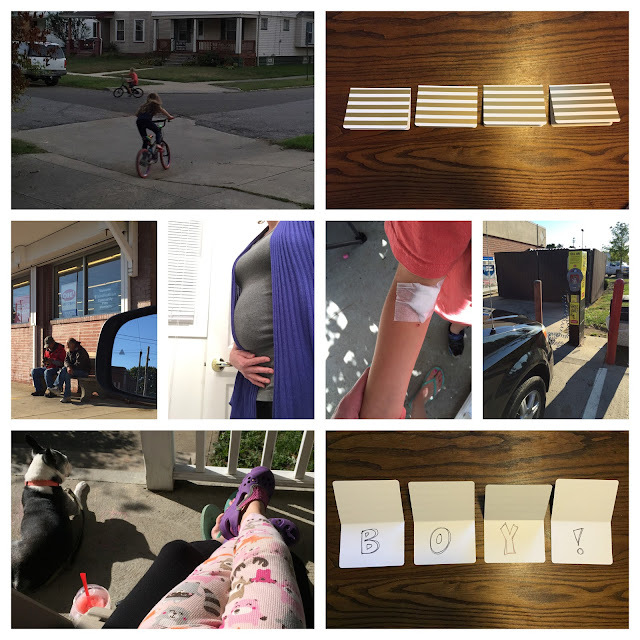 The number of weeks along I am in my FIFTH (and unexpected) pregnancy! Yikes. For some of you, that's old news, and for others, surprise! I'm expecting! , we are actually starting over instead. 18. How old I was when my husband and I started dating for the first time. We are high school sweethearts and have only ever dated each other, which I know is an uncommon story. 17. The age I finally got my drivers license. I wasn't in a hurry for some reason. I also had to get my little sister out of bed on the day of my driving exam because I didn't know how to get to the license bureau. Sad, I know. I will never hear the end of that one. 16. The age I met my husband, when we were in youth group together. My first memory of him was when he stood up in front of everyone to share a story about how the Lord uniquely met him in a time of need. He was feeling down and for some reason and found himself sitting outside on a couch, which was awaiting garbage day on the curb. A woman walking by saw him sitting there, looking glum, and she told him that God loved him and had a plan for his life, and that everything was going to be okay. I'll never forget that story. That's the first time I noticed him. 15. The year I decided I no longer wanted to be an FBI agent. In elementary school, I fancied myself a spy at home and school, and every career day that I can remember in middle school, I attended the session with the FBI guy. I had listening devices and fingerprint kits and magnifying glasses and microscopes. I'm sure all the other kids thought I was really weird. 14. The date in May of the last moms group before summer, where in a random stroke of luck, I won a diaper truck gift set. I had just finished telling my mom how I never win. There are 400 other women to compete with each year, so the odds are not great. But I won a bunch of diapers. Did I need it? No, but I had a baby shower in the near future and am a fan of re-gifting. Then I found out two weeks later I was pregnant. The diaper truck is in my closet. 13. Hundred and 50 square feet. The size of our house, which will need to work for our soon-to-be family of 7. My husband thinks that another baby will make things too cramped. I think we just need less crap. I'm not sure which side God has fallen on yet, but I think he will pick mine. 11. The number of years we've been married. When I thought about our future together early on, I never would've imagined we'd have five kids and live in the inner city. 10. The number of rooms we have in our house, which includes 3 bathrooms. I have a hard enough time keeping them clean on a weekly basis, and I don't think I want more space to hold more things that I will have to dust and clean. Housekeeping is not my favorite; just ask my husband. 9. The age our oldest will be when the baby is born. 8. The number of articles I usually have to read about whatever current health phenomenon I'm hyperventilating about before I start to feel better. This is usually all before I stop to pray, which should be the first thing I do. 7. The number of days each week I'm a crappy Christian, if you hadn't already gathered that from #8. Thankfully all is grace and He loves me anyways. 6. The number of children my mother thinks we should have. Good thing I can stand up to peer pressure. Just say no to drugs, unless it's a tiny little miracle pill that prevents any future offspring. 5. The number of children we will be the proud parents of come next February. Lord have mercy and send reinforcements. And food. 4. The number of children we currently have, and the number that are very excited about the arrival of their surprise sibling. 3. What the age gap between the last two kids will be. Baby Boy Roberts, due February 5, 2015. 19 things about you? Anyone?